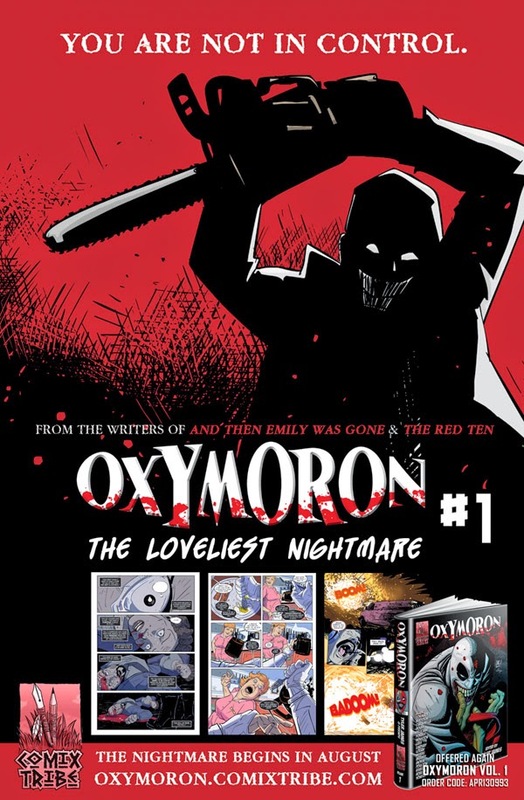 ComixTribe announced today the upcoming release of OXYMORON: The Loveliest Nightmare, a new monthly crime/ horror series debuting in August. Writers John Lees (And Then Emily Was Gone) and Tyler James (The Red Ten) are joining forces with Alex Cormack (Find) to tell a cop versus contradiction-obsessed killer thriller in the vein of Hannibal and Se7en. "Imagine the Joker came to a Gotham WITHOUT Batman?" offered John Lees. "That'll give you a hint of the flavor of this series." The story features ComixTribe's popular OXYMORON character, who first appeared in THE RED TEN #1, and then later in his own Kickstarter-launched anthology hardcover in 2013. "While current Oxymoron fans are sure to be on board, The Loveliest Nightmare is very much a Year One style series, and the perfect jumping on point for new readers," said Lees. The Loveliest Nightmare tells the story of Mary Clark, an afflicted detective suffering from a debilitating chronic illness, and reeling from a demotion back to street cop after her partner’s death. She hates being in uniform, resents her young, wide-eyed partner, and is persona non grata with the rest of the police department. She's sleepwalking, but the Oxymoron case wakes her up. When what appears to be a lone nut job in a mask jumping off a skyscraper turns out to be the opening gambit in a killer’s master plan to cleanse a corrupt city of its many contradictions, Mary sees taking him down as a chance to prove herself and earn back her Detective badge. But once the true severity of the Oxymoron's plan is revealed, she realizes there are much higher stakes than her career in play. "I could not be more excited for this series to drop," says Oxymoron creator and series co-writer Tyler James. "Last year, the John Lees made the comic industry stand up and take notice with AND THEN EMILY WAS GONE. His work on this series is equally brilliant. But the real breakout star here is Alex Cormack, who has taken his storytelling to the next level. Alex's linework, paired with the lush colors of Jules Rivera make this one of the most beautifully horrifying books ComixTribe has released yet. You see what I did there?" Each issue of the series features a standard cover by Alex Cormack and a variant cover by industry superstars and upcoming talent, including Charles Paul Wilson, III (Stuff of Legend, Wraith), Iain Laurie (And Then Emily Was Gone), Joe Mulvey (SCAM) and more. 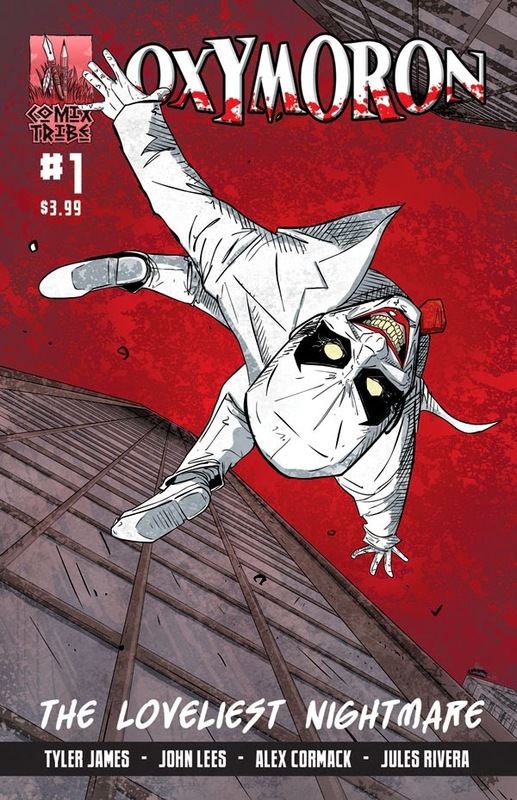 ComixTribe has announced that teaser images, previews and more will be posted at the new OXYMORON Facebook Page, in anticipation of the series' release later this summer. 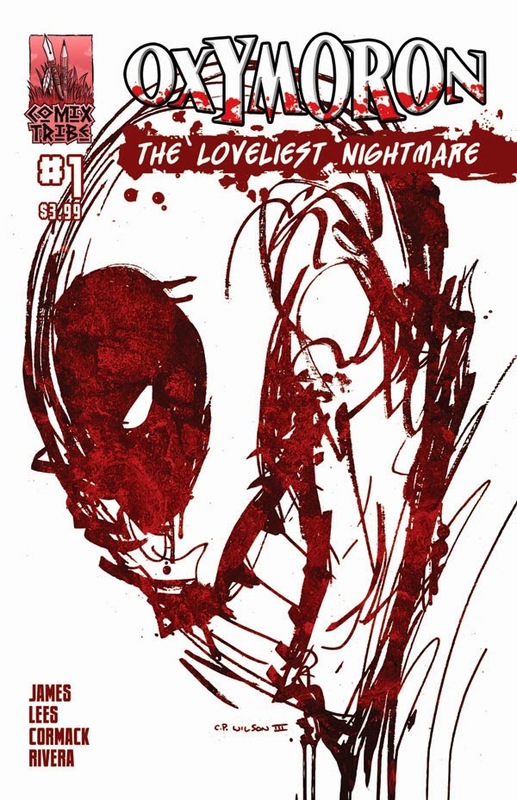 OXYMORON: The Loveliest Nightmare will release in the direct market and digitally (day-and-date) on Comixology. Series subscriptions can also be purchased now on ComixTribe's online store. Readers who pick up ComixTribe's 2015 Free Comic Book Day title AND THEN EMILY WAS GONE #0 will also be treated with a preview of this series, as well as an all-new OXYMORON short by James and Cormack.